My Threadbear Life: Three Little Upcycles & A GIVEAWAY !!! a journal of life at Threadbear Cottage . 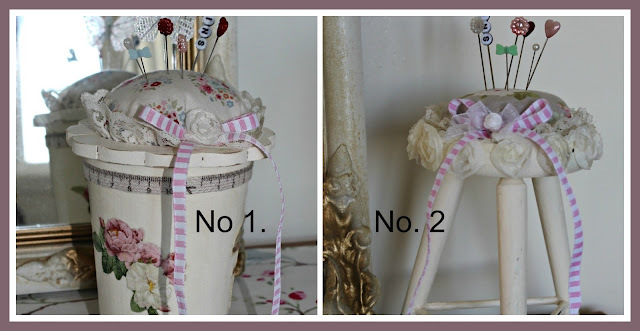 . .
Three Little Upcycles & A GIVEAWAY !!! Goodness .... those last two weeks flew by in the blink of an eye !!! 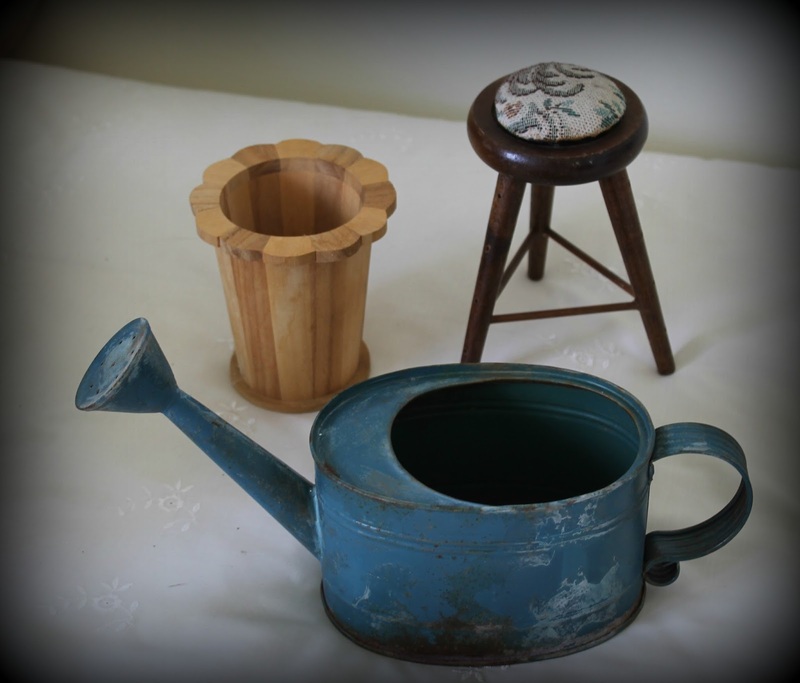 The 2 wooden items above were from my dear friend Leeanne & I honestly can't remember where the Watering Can came from .... no doubt some Op Shop bargain bin !!! The wooden pieces got painted 'Cottage Cream' as I had decided they were destined to become pincushions. The rusty little watering can got sanded & then painted outside as well as inside . . . I gave it an ever-so-slight sand to distress it a teeny bit. Yesterday was my blogging birthday ... yes 5 whole years of blogging !!!! 5 years of listening to my rambles . . . . I think you all probably deserve a medal !!!! So I thought to myself .... would you like to win one of my pincushions perhaps?? 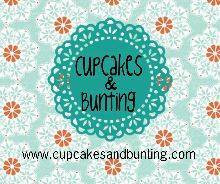 - You can choose any pincushion you would like to win. - I will post anywhere in the world! - Anyone may enter ! - Along with the pincushion of your choice, I will make up a small parcel of soaps, Tilda tags, a Tilda Peg fridge magnet & some choccy treats. - There will only be 1 draw for one of the pincushions. Simple enough I am sure. These early Autumn days have been so lovely weather wise ... it is enjoyable to sit out on the deck & paint my little upcycle projects. Recently after visiting with Alec, I called to see my friend Elaine on the way home to deliver some worm tea. Elaine was right in the midst of a de-clutter !!!! 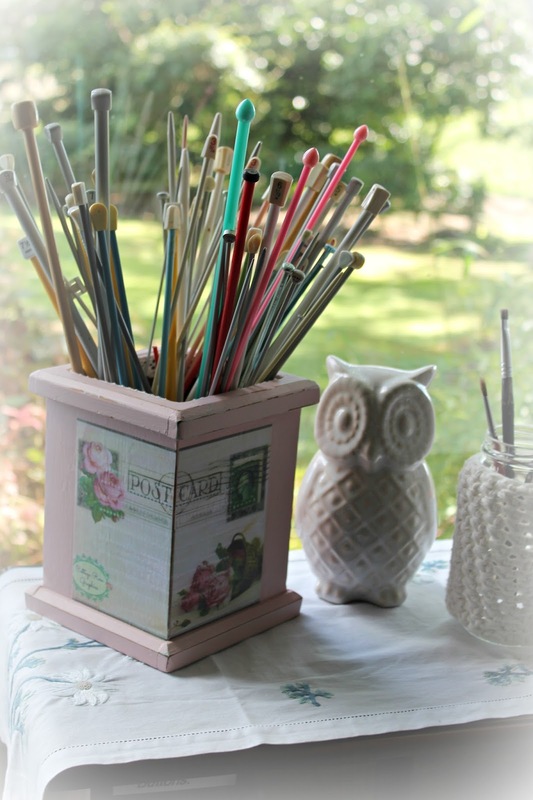 I wasn't sure what to do with it for a few days until I decided it might be a good holder for all my knitting needles . . . . I look forward to sharing with you friends, what I have done with some of the other treasures from Elaine. Hi sweet Julie! Oh, I love both pin cushions but especially number 2. I hope your mum is well. Have a happy week, friend! Oh and happy 5 year anniversary of blogging! Crikey Julie you got me wondering how long I have been blogging? I went to find out...... 7yrs tomorrow! Time sure does fly doesn't it and the fact that we met through blogging is pretty awesome. I knew you would whip up something amazing with those wooden thingies.......they both look great! As does the water can gift basket :-) These blimmin' cats sure have the life! happy anniversary/birthday to your blog! & a wonderful lot of ramblings & modge podges it's been too! love watching you transform many sad & unloved into gorgeous & glamorous, loved the ups & the downs & watching Pippi Longstockings grow up & become the beautiful helper she is now. the adorable Blackie is a sweetie too! here's to many more ramblings & modge podges! Ah! Bless! Are Pippi and Blackie included in the giveaway!!! :). soap, and sold already, yes, l can believe that! post Julie...as usual...! Great fun..! :0). Hi Julie happy blogaversary,how nice of you to have a giveaway,if I was lucky enough to win could I pick pincushion number two please . You do such a lovely job of upclycling ,well done Julie . 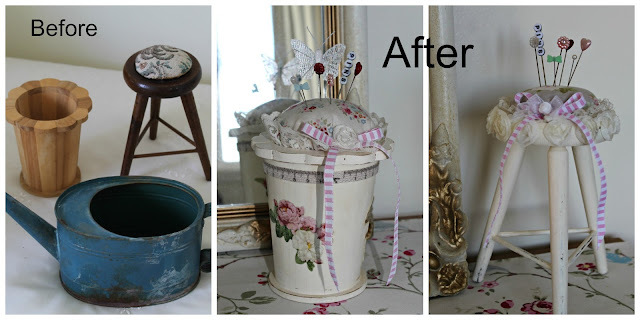 I am addicted to your blog and reading about your upcycled transformations.Awe inspiring! I'd like to win pincushion no.1. Praying you draw my name! Congratulations on your blog anniversary. I've only recently discovered your blog, but look forward to your posts. I love both the pin cushions, but if I was fortunate enough to be chosen as the winner, I would LOVE No. 2! What great makeovers! Love all of them! Good morning from the USA. I love your blog and wish you would post more frequently, although reading your post I can absolutely see how busy you are. What a treasure to see all the upcyle things you do. What a great imagination and seeing a treasure in others junk. I have a hard time commenting on anyones blog so I hoe this reaches you and you add my name for the giveaway. I wish I lived near you because I would probably visit you, your shop and you grounds for inspiration. I am 74 years old and my energy is not what it used to be but I still love to dabble in projects. Thanks for a great blog and have the very best day. Sandy maniscalco from long island NY no blog. I would like #2 pincushion if I am so very lucky to be the winner. Congratulations on your anniversary. ..how time flies!!! Your make kvers are beautiful, I am not surprised the watering can has flown out of the cottage, you present things so beautifully there. Great idea for your knitting needles in that pretty container. Moving house is such a big job isn't it, and to be nearly due to have a baby would make it harder!! Excitement must be mounting!! Voth poo incushions are beautiful but No 1 appeals the most to me if I was lucky to win!! Miss Pippi and Blackie look lovely and relaxed there while supervising you!! Woke to rain this morning, such a wonderful sound on the roof. Hi Julie, Congratulations on your blogging anniversary. I have been reading your blog for several years now and am always in awe of the makeovers and other gorgeous things you make. If I'm ever down your way (I live north of Auckland) I will certainly be calling in to feast my eyes in person. Love to hear about the kittys, animal antics are so entertaining. Congratulations on the soon to arrive grandbaby. I am expecting my eighth grandbaby in June - its so exciting. I have only joined your mailing list fairly recently and I adore the way you can turn something unloved and unwanted into something divine. I, myself, try to recycle and updo as much as I can, but I have to admit, I don't always have the best eye. I love both of your pincushions. My mum was a dressmaker in her younger years (she's 80 now and has just had her 2nd knee replacement operation). She worked in one of the busier dressmakers shops in Queen St. Brisbane many years ago. Should I be lucky enough to win one of your pincushions, I would like to give it to her. She's had to be such a tough old love and I'm sure she would appreciate it! Lol...oh gosh!11 your 4 legged friends look absolutely bushed!!!! lol I love the treasures you picked up and worked on. Very cute. I would to win any one of the items you have to give away!!!! I know you already know this but....I love your knitting needle holder. What a special friend you have there. Have an awesome week!! Congratulations on 5 years! I always look forward to your posts. I have just the spot for 1, if I am lucky! You are always so gentle and kind. Every post is so uplifting. Both pincushions are lovely bit no 1 has a slight edge for me. Thanks or the chance. Thank you for this opportunity! Congratulations on your 5 yr Bloggingversary, I am new to your blog, and have enjoyed all your posts that I have so far read and would one day love to visit your shop :) I love all your creations but I think Number 1 is the winner on this occassion. Congratulations on your 5 year blogging birthday Julie - lots of beautiful posts and lots of beautiful photos! What a lovely giveaway - I'd love to put my name down for the stool (#2) should I be lucky enough to win - thanks for the chance to enter!! I love your blog, I don’t read many regularly but yours is one. Congratulations on 5 years of blogging. I live in Hamilton so am not that far away but haven’t made it to visit your shop yet. I am also an op shop fan and like upcycling, not doing too much on that line at present though. Ps I like pincushion 1 best. I recently found your wonderful blog, how have I missed this lovely place for 5 years? Not sure how I've missed you but I'm really glad to have found you. I am amazed at what you did with those 3 items. This blog makes me stop and think while I'm in the thrift store or at a yard sale. Thank you for helping me see found items with a new eye. I would love pincushion number 1. It is just lovely. Thank you for this wonderful, lovely. creative place. Hi Julie, I love seeing your projects, especially your vision bringing old things back to life. I like number 2! Jessica. Great little recycles! So nice to see what you do with things to give them a new life! Yipee! 5 years of blogging - what a great blogaversity - just counted how long we have been going - only 4 years. 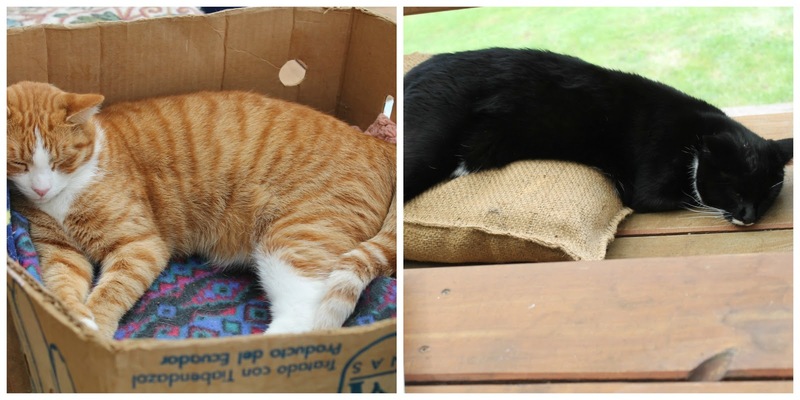 The cats sure do look happy - banana boxes rock! Congratulations on your anniversary! Wonderful giveaway! Congratulations on your anniversary and for sharing your special times. Having anything in my craft room that you have created would be so precious. I particularly like number 1. Congratulations lovely, your rambles are just so delightful.. they are a real treat to read. Your ideas and your amazing ability to turn ordinary things into things of beauty is astounding.. proud you're my sister in law. Without a doubt you are the Queen of upcycling! Your pincushions are both beautiful and will make whoever wins them very happy! I love everything you do, you talented Lady . I'm not entering your giveaway - I wish I had seen it earlier and I would have given you a shoutout! I meant to add that I was the lucky winner of one of your beautiful angels a couple of years ago... that's the reason I'm not entering your draw! Every time I look at my angel, I think of you dear Julie and the beautiful things you make! Hello, I'm Julie, welcome to my blog and thanks for stopping by :-) This is a journal of my life at Threadbear Cottage, come share it with me as I create, garden, bake, thrift, recycle and try to live a simpler life (!!!). I am happy to have you along & hope you enjoy my ramblings.